The Golden Joysticks are over, and the winners have been revealed. A bunch of videos have surfaced from the event; in the form of both new trailers and acceptance speeches from triumphant absentees. Don't worry if you missed the action live, as we've now rounded up those videos into a single post. 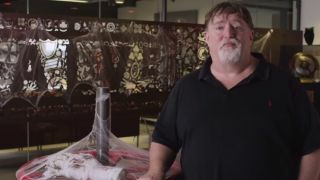 Yes, those are spider webs and a severed hand by Gabe Newell. Hopefully it's a Halloween thing.